3) If you happen to sit behind a studious student, you automatically get an inspiration. 6) A student who does not help you during exam time is a terrorist and such a person should be immediately sent to Pakistan. 7) The first person to leave the hall after finishing the exam is seen as the hero of the class. When he goes out, he waits at the entrance and makes sure some body else joins him. So he encourages the others from outside showing hand gestures to come out soon. 8) People who teach us sure-shot questions right before we enter the exam hall are the spiritual gurujis of the class. 10) I forgot the 10th point. This always happens with me. For a ten point answer, I would always forget one point. But I would not just leave it blank. I would fill that point with some answer as I have done here. 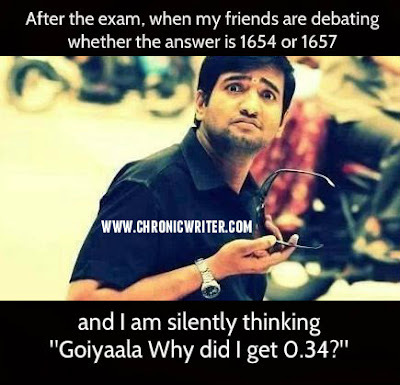 Click this link [ Examination Blues - Those School days] to know about my school day exam time memories. :D For a few exams, all that I studied were the headings from the syllabus sheet. But I was skilled enough to write a couple of pages about it. Least did I realize then that I can become a writer instead of a Biotechnologist! In our field, the terrorists are those who use many colour pencils to draw big diagrams and neatly label something that you can see from far with burning tummy but cannot get to know what the hell the labels are. So your first post was in 1982, hmmmm.....?! LOL at that comment mam. The detailed post has those information. I will try to catch up on a few more posts. I hope you and your family have been well, and emerged from the floods unscathed. Congratulations! Your blog post was selected for Spicy Saturday Picks edition on December12, 2015 at BlogAdda. You are giving exam now?